Happy Friday and happy summer! It really is making a presence recently. The rain clouds have finally parted for a spell, and the sun is shining generously. Of course, this means fruits and vegetables are really putting on lots of growth. The peaches are looking absolutely gorgeous and the earliest varieties are starting to color and finish sizing up. We are estimating only two to three more weeks until the first harvest! And there are a lot of them, that’s for sure. I have been debating on calling this the year of the peach. It has a nice ring to it. One crop we are really hauling in at the moment is beets. We seeded a large first planting this year and they sure are beautiful. We have filled several twenty bushel bins like the one pictured here with beets and there are still plenty more to go. They are a huge hit at Rochester Public Market, as well as with some of our CSA customers. I know not everyone loves beets, but those who do are very, very happy. The greens on them are just stunning, and loaded with nutrients. So if you do happen to have some beets to eat, don’t throw those greens out! Boil them like spinach, toss them in a salad with our lettuce, or mix them in with a quinoa or other grain salad. God save the greens! 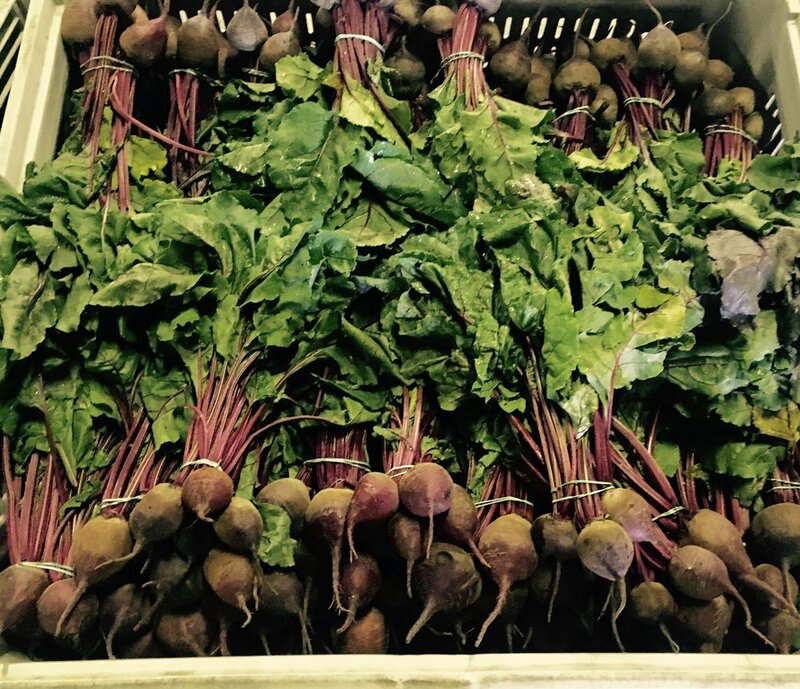 Like I mentioned, beets have been one of the items in our CSA share for the past two weeks. In this picture from week #3, the beets are packed in there tightly with garlic scapes, edible pod peas, a living basil plant, apples, zucchini, and buttercrunch lettuce. This is a full share box, and it is filled to the brim. I absolutely could not resist taking a picture of it. If anyone doesn’t know what a CSA is or how ours works, head on over to the CSA page on our website and there is all the information you need to know. If you do have a question, feel free to call our market or email us! These beautiful little darlings are the blossoms that pickle plants produce. There is a difference, can you see it? Like many other vegetables, especially cucurbits, there is a male and a female flower. Fascinating, right?! 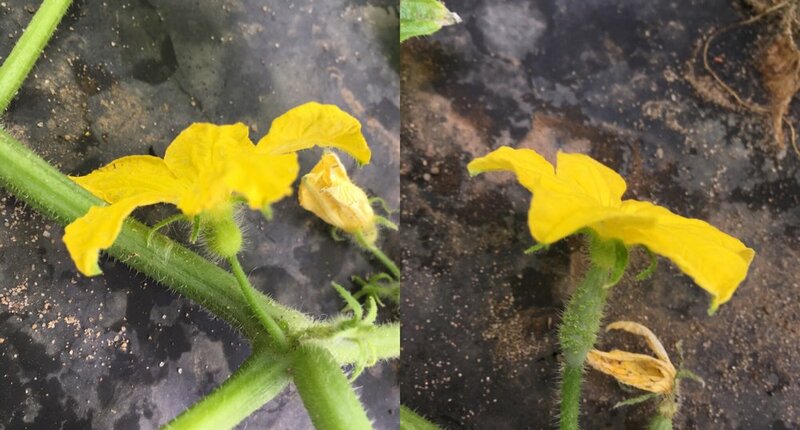 You can tell which one is female because of the baby pickle that is just beginning to take shape at the base of the flower. The male flower only exists to provide pollen in order to grow the seeds inside the fruit (pickle). I know, cucumbers sound like they should be vegetables, but in reality they are a fruit. This is because they are something the plant produces, not part of the plant itself. Time for the mystery vegetable!! Or fruit? You tell me! This tall and ferny beauty is loaded with tiny yellow flowers and some little green balls too… hmm...interesting. Let me know what you think it could be in the comments! Thank you for reading all about my life as a farmer, I truly appreciate it! See you back here next Friday!